Today’s entry in our ongoing look at famous diary entries is a dark one! In the 1840’s a group of pioneers who came to be known as the Donner Party found themselves trapped in the Sierra Nevada Mountains. 36 of its 81-member party unfortunately died as a result of exposure, starvation, and disease. 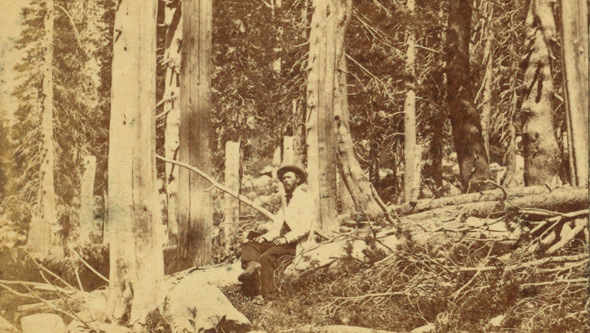 The diary entry below is from Donner Party member Patrick Breen’s journal, a remarkable documentation of the hardships and conditions that the group of pioneers had to endure. Breen reportedly wrote this diary on several sheets of paper folded to form a thirty-two page book. He used up twenty-nine of the books thirty-two pages, writing it between November 20th, 1846 (several months after the journey began in April) and March 1st, 1847 – the day of the rescue party’s arrival! Breen speaks of the distress he feels about “Mrs. Murphy’s” idea of eating “Milt.” (“Mrs. Murphy said here yesterday that [she] thought she would commence on Milt and eat him. I don’t think she has done so yet; it is distressing.”) And he mentions the Donners’ having spoken 4 days earlier of eating their buried dead if they couldn’t find their cattle. He concludes the entry suspecting that they’ve already resorted to doing this. froze hard last night to day clear & warm Wind S: E: blowing briskly. Martha’s jaw swelled with the toothache: hungry times in camp; plenty hides, but the folks will not eat them. We eat them with a tolerable good apetite. Thanks be to Almighty God. Amen. Mrs Murphy said here yesterday that [she] thought she would Commence on Milt. & eat him. I don’t [think] that she has done so yet; it is distressing. 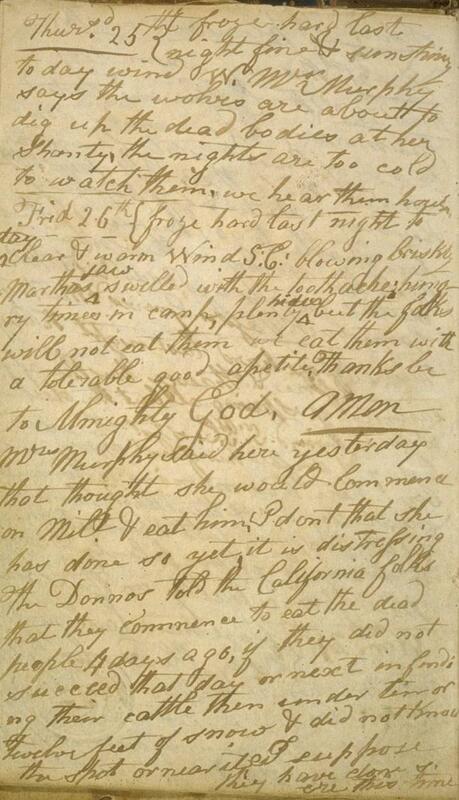 The Donners, 4 days ago, told the California folks that they [would] commence to eat the dead people if they did not succeed, that day or next, in finding their cattle, [which were] then under ten or twelve feet of snow, & [the Donners] did not know the spot or near it; I suppose they have done so ere this time. For the full diary visit the Online Archive of California‘s archives here. did the donner party eat each other? Unfortunately, some members of the party were forced to resort to cannibalism in order to survive. It is hard to imagine the hardship the Donner Party endured and the choices they were forced to make under unimaginable duress. The stage was set when early on they were misled into trying a risky shortcut through the Sierra Mountains in a record snowfall year and an unfortunate event of having their livestock wander off contributing to their fate. My husband, Daniel O Stuhlman explores the event and exploiters, family members, and heroic rescuers with compassion in his newly published young adult work of fiction, Maddie’s Chronicle.. His fictionalized rendition is based more in the spirit of character strength and weakness during a difficult situation with an empathetic eye . As a nephew of Charles Hopper a Pilgrim of the Pacific who traveled on the Bidwell Bartleson Wagon Train in the 1840’s, Dan set out to write a story for his nieces and nephews, but found he could not avoid the Donner Party story in that historical period. In the last third of the book, his fictionalized character, Huck Hopper is based on one of the rescuers. Would love someone to read the book and give their thoughts. If you know the movie 17 miracles in the beginning it talks about people who got stuck and ate each other. Was that the Donner party? Good question! We aren’t too familiar with that film, but the events that it depicts took place about ten years after the Donner Party incident, so it’s quite likely this would have been referenced in 17 Miracles. Unfortunately these aren’t the only times in recent history that this has occurred, either. The Andes Flight Disaster in 1972 led to similar consequences. Havng read this I thought it was really enlightening. This was a very useful source and my writing piece for school just got better. an exhausting excavation was done in 2014 at the site of the camp at Donner Lake and Alder Creek and no evidence was found of any cannibalism. I am doing an essay about them, what was the result to the Donner Party?